In Genesis 24, Abraham sent his servant to a foreign land to find a wife for Isaac. When he got there, he met a girl named Rebekah at a well, she drew water for him, she ran off to tell her family about it, and later she and Isaac were betrothed. Something similar happened to Jacob. He went to a foreign land to find a wife, he met Rachael by a well, he drew water for her, she ran to tell her family, and Jacob and Rachael were betrothed (see Genesis 29). As with all true stories, the author could have told these stories in many different ways. However, the reason these two stories are so similar is because they are both based on the same pattern, called a type-scene. A type-scene is an ancient storytelling technique where certain kinds of stories are told in certain ways. 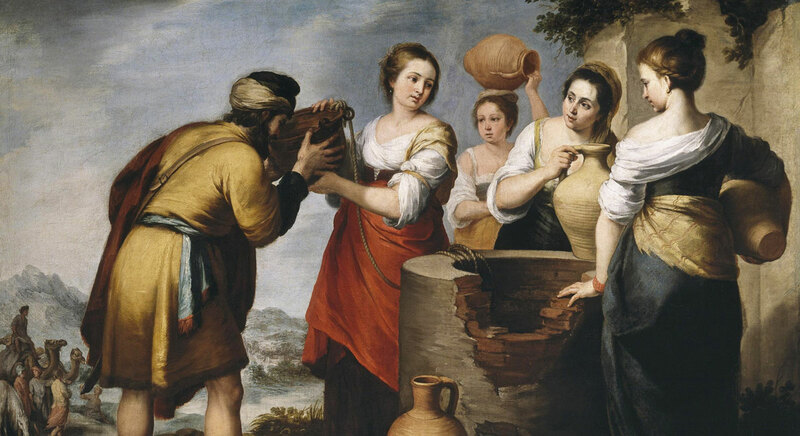 The ancient audience expected that when a main character got engaged, for example, he would journey to a foreign land, encounter a woman at a well, and draw water from the well. Then the woman would rush home to tell the family, and the man and the woman would be betrothed. However, each time the storyteller applied this type-scene to a new character, they would change the story slightly. This allowed the type-scene to fit each character’s historical circumstances, but also gave insights into the personalities of each character in the story. Figure 2 Rebekah at the Well from the Phillip Medhurst Picture Torah. For instance, biblical scholar Robert Alter noted that “it is only in [Isaac’s] betrothal scene that the girl, not the stranger, draws water from the well.” This fits well with what we see Rebekah doing later, when she took “the initiative at a crucial moment in the story in order to obtain the paternal blessing for her favored son, Jacob.” Ultimately, “Rebekah is to become the shrewdest and the most potent of the matriarchs, and so it is entirely appropriate that she should dominate her betrothal scene.” The more these stories differ from the basic type-scene, the more one can expect that the characters in the scene will turn out differently than expected. Alan Goff has pointed out a radically different, but still recognizable, version of this type scene in Alma 17. Just as in the classic type-scene, Ammon went to a foreign land, but in this case, he went to preach the gospel (Alma 17:12). Although Ammon did not meet a woman there, the king offered Ammon his daughter in marriage, but he declined (v. 24). Shortly thereafter, Ammon went to the waters of Sebus, rather than a well, to water the flocks (v. 26). Finally, instead of the woman returning to tell the family about the presence of a potential suitor, the servants returned to the king with the arms of the would-be sheep rustlers (v. 39). Figure 3 Defending the Flocks by Brian C. Hales. Figure 4 Eres el gran Espiritu by Jorge Cocco. For a concrete example of this in the Book of Mormon, see Book of Mormon Central, “Why Are there Multiple Accounts of Joseph Smith’s and Alma’s Visions? (Alma 36:6–7),” KnoWhy 264 (January 20, 2017). For an introduction to type-scenes, see Michael Austin, “How the Book of Mormon Reads the Bible: A Theory of Types,” Journal of Book of Mormon Studies 26, (2017): 51–53. For one perspective on how type-scenes are a subtle witness for the authenticity of the Book of Mormon, see Alan Goff, “Uncritical Theory and Thin Description: The Resistance to History,” Review of Books on the Book of Mormon 7, no. 1 (1995): 187–190. 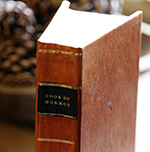 For a few examples other examples of type-scenes in the Book of Mormon, see Richard Dilworth Rust, “Recurrence in Book of Mormon Narratives,” Journal of Book of Mormon Studies 3, no. 1 (1994): 42–43. Robert Alter, The Art of Biblical Narrative, 2nd ed. (New York, NY: Basic Books, 2011), 62. Alter, The Art of Biblical Narrative, 62. Alter, The Art of Biblical Narrative, 63. Alter, The Art of Biblical Narrative, 64. For one example of this, see Alter, The Art of Biblical Narrative, 70. Alan Goff, “Reduction and Enlargement: Harold Bloom’s Mormons,” Review of Books on the Book of Mormon 5, no. 1 (1993): 105. Goff, “Reduction and Enlargement,” 105. For more context on this story, see Brant A. Gardner, Second Witness: Analytical and Contextual Commentary on the Book of Mormon, 6 vols. (Salt Lake City, UT: Greg Kofford Books, 2007), 4:275–276.